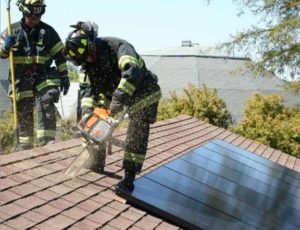 Firefighter Safety & Solar Photovoltaic Panels On Buildings ?? 2016-09-14: Only now are we really catching up with the extremely serious matter of Fire Safety in Sustainable Buildings … serious for building occupants … and firefighters ! The Performance Target for New Construction must be Positive Energy Buildings. 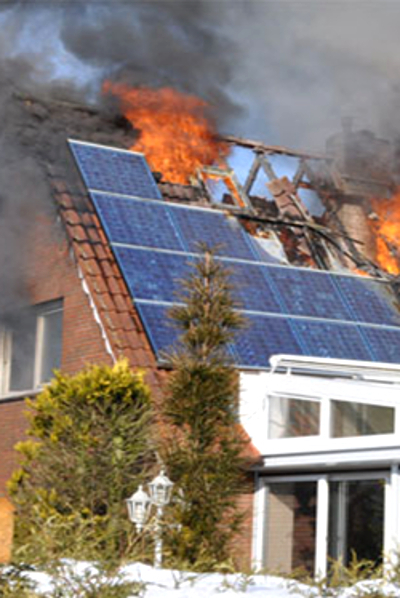 Colour photograph showing a house fire caused by Solar Photovoltaic Roof Panels. 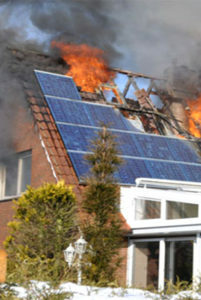 At the beginning of this decade, a Fire Research Project was carried out by the Underwriters Laboratories Firefighter Research Institute in the USA … and it addressed the issue of firefighter vulnerability to electrical hazards, and serious injury, when fighting a fire involving Solar Photovoltaic (PV) Modules and Support Systems installed on buildings. Colour photograph showing two firefighters on a roof, one with cutting equipment. 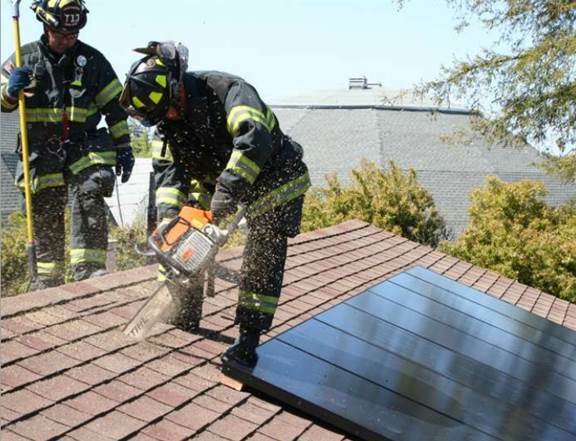 Solar Photovoltaic Roof Panels restrict firefighter access to building interior roof spaces. The Total Global Solar Energy Capacity averaged 40 % annual growth from 2000 to 2010 (source: International Energy Agency). In the USA, Grid-Connected Solar Photovoltaic Capacity grew 50 % per year for much of that time (source: US Federal Energy Regulatory Commission). These trends increase the potential of a Fire Service Response to a building having a Photovoltaic Installation, irrespective of the PV being involved with the initiation of the fire event. As a result, conventional firefighter tactics for suppression, ventilation and overhaul have been complicated, leaving firefighters vulnerable to potentially unrecognized exposure. Though the electrical and fire hazards associated with electrical generation and distribution systems are well known, PV Systems present unique safety concerns. A limited body of knowledge and insufficient data exist to understand these risks … to the extent that Fire Services have been unable to develop safety solutions and respond in a safe manner. This Fire Research Project developed the empirical data needed to quantify the hazards associated with PV Installations … and provided the foundation to modify current or develop new firefighting practices to reduce firefighter deaths and injury. Colour photograph showing a large array of Solar Photovoltaic Panels on a roof. Extra loading on roof structures must be considered, as well as possible interference with roof fire evacuation routes for able-bodied occupants. Assessment of potential shock hazard from damaged PV Modules and Systems. The electric shock hazard due to the application of water is dependent on voltage, water conductivity, distance and spray pattern. A slight adjustment from a solid fire hose stream towards a fog pattern (10 degree cone angle) reduced measured current below perception level. Salt water should not be used on live electrical equipment. A distance of 6 m has been determined to reduce potential shock hazard from a 1000 VDC source to a level below 2 mA, considered as safe. It should be noted that pooled water or foam may become energized due to damage in the PV System. Outdoor weather exposure-rated electrical enclosures are not resistant to water penetration by fire hose streams. A typical enclosure will collect water and present an electrical hazard. Firefighters’ gloves and boots afford limited protection against electrical shock provided the insulating surface is intact and dry. They should not be considered equivalent to Electrical Personal Protective Equipment (PPE). Turning off an array is not as simple as opening a disconnect switch. Depending on the individual system, there may be multiple circuits wired together to a common point such as a combiner box. All circuits supplying power to this point must be interrupted to partially de-energize the system. As long as the array is illuminated, parts of the system will remain energized. 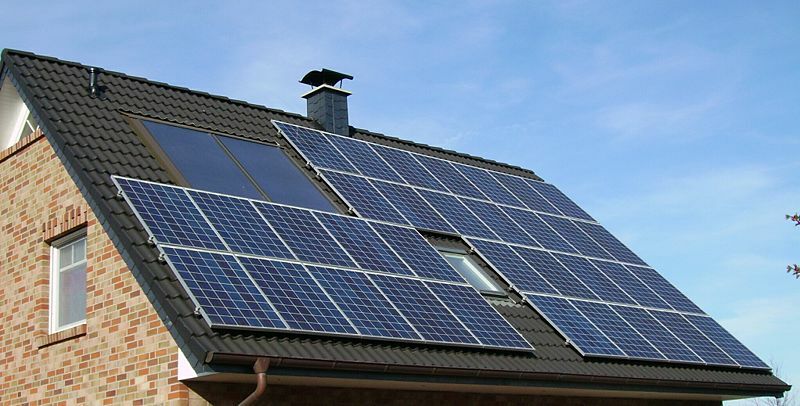 Unlike a typical electrical or gas utility … on a PV Array, there is no single point of disconnect. Tarps offer varying degrees of effectiveness to interrupt the generation of power from a PV Array, independent of cost. Heavy, densely woven fabric and dark plastic films reduce the power from PV to nearly zero. As a general guide, if light can be seen through a tarp, it should not be used. Caution should be exercised during the deployment of tarps on damaged equipment, as a wet tarp may become energized and conduct hazardous current if it contacts live equipment. Also, firefighting foam should not be relied upon to block light. When illuminated by artificial light sources, such as Fire Department light trucks or an exposure fire, PV Systems are capable of producing electrical power sufficient to cause a lock-on hazard. Severely damaged PV Arrays are capable of producing hazardous conditions ranging from perception to electrocution. Damage to the array may result in the creation of new and unexpected circuit paths. These paths may include both array components (module frame, mounting racks, conduits, etc) and building components (metal roofs, flashings and gutters). Care must be exercised during all operations, both interior and exterior. 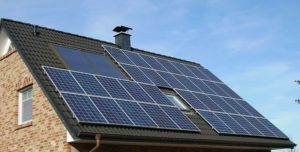 Contacting a local professional PV Installation Company should be considered to mitigate potential hazards. Damage to modules from tools may result in both electrical and fire hazards. The hazard may occur at the point of damage or at other locations depending on the electrical path. Metal roofs present unique challenges in that the surface is conductive unlike other types such as shingle, ballasted or single ply. Severing of conductors in both metal and plastic conduit results in electrical and fire hazards. Care must be exercised during ventilation and overhaul. Responding personnel must stay away from the roofline in the event of modules or sections of an array sliding off the roof. Fires under an array but above the roof may breach roofing materials and decking … allowing fire to propagate into the attic space of the building.